Working on something decorative for the house. Obsessed over this element for months and it finally came in from Yelm, Washington today. I hope it turns out they way I hoped, we’ll see. omg! Can’t wait to see it. Ha, Jennie – you’ll have to wait a little while longer, I haven’t quite figured out to make it work. We’ll see. Yelm is only about 30 miles from our house! Hi D’Arcy – I thought about you when I contacted this guy. Didn’t know how far away you were, but it’s 2,361 miles from me. Hi Kate! Me too – I’m still figuring out this is going to work. Hi Leslie – I found a sign maker in Washington state. I tried to get someone local or closer, but I had specific requests, and he was the only one I could find that would take on the project. I searched the web for several days and couldn’t find an example of what I was trying to do. So we’ll see if this works out. Nice and ornate! Is it beech? Have you done any of the carving? Would love to give that a go! I guess a lot is done by cnc these days. Looking great Curt, keep up the top work! Hi Pete! It’s pine, to go with the ceiling in the adjoining room. 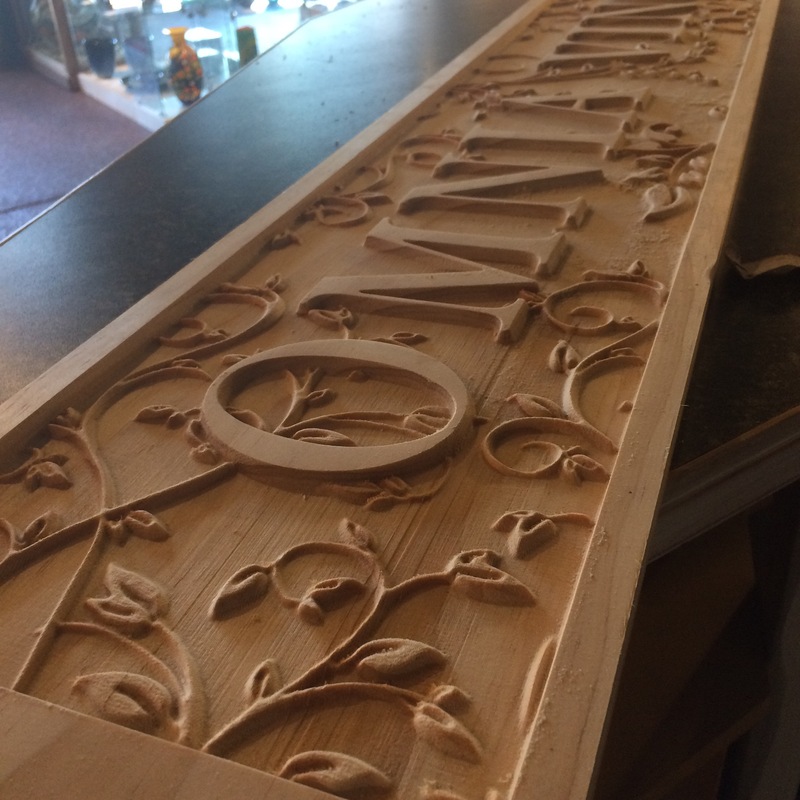 This was done with a CNC, but and it’s 8′ long. I spent the day yesterday sanding out small grooves and all the grain fibers left by the bit. I had a hard time first explaining what I wanted and finding someone who could not only carve the piece at this size, but also be able to write a program for the leaf background. It took him two tries, but it came out OK. Now I just have to make it work. I love it. Most of my house / DIY projects are just art projects that are occasionally functional too. Hi Ben, yep, I hear you on this one. After renovating this place for 8 years and not having moved in yet, it just dawned on me recently that this is more about art than 2X4’s. Happy DIY. This is beautiful. But what does it say?? My project is definitely an art project. Think I’ve always known that. Can be hard on Trev when I am obsessing over the detail. But I want to be surrounded by beautiful things! !